"We don't want to see Israel isolated," says EU foreign policy chief. 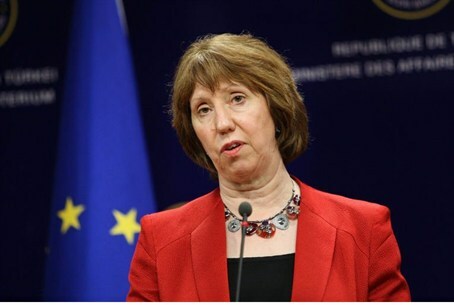 The European Union’s (EU) foreign policy chief, Catherine Ashton, said on Monday that Europe is opposed to boycotts against Israel. At the same time, she also reiterated the EU’s objection to Israeli construction in Judea and Samaria. ''The European Union opposes a boycott of Israeli companies and businesses. We don't want to see Israel isolated,” Ashton said at a press conference after a meeting of the 28 EU Foreign Ministers in Brussels, according to the European Jewish Press (EJP). “The EU fully supports U.S. Secretary of State John Kerry’s efforts as well as the Israeli and Palestinian engagement in the current negotiations,” she added, reiterating that the EU is ''determined'' to offer Israel and the Palestinian Authority (PA) with an “unprecedented” package of support measures for both parties if an agreement is reached. ''We want this to create huge opportunities in transport, energy, water, environment, people to people and business to business contacts. We want to see progressive market integration, trade and investment facilitation, research and innovation, security cooperation that will benefit both Israel and the Palestinians with a special emphasis on young people,'' Ashton said, according to EJP. ''Our approach will be tailor-made and will be negotiated with both partners,'' she said. “Israeli Prime Minister (Binyamin) Netanyahu and (PA) President Abbas need to make important decisions,” she added. Months ago, the EU published new guidelines which boycott Israeli entities operating beyond the 1949 Armistice Lines. This caused tension between the EU and Israel, which warned that it might shun a key EU research program unless a compromise is found over the boycotting guidelines. Ashton’s comments are the latest in several attempts by European officials to assure Israel that the EU is against boycotts of the Jewish state. A similar sentiment was expressed last week by visiting British Prime Minister David Cameron, who said in a speech at the Knesset, "Britain opposes boycotts. Whether it is trade unions campaigning for the exclusion of Israelis or universities trying to stifle academic exchange, Israel's place as a homeland for the Jewish people will never rest on hollow resolutions passed by amateur politicians." At the same time, Europe has been pressuring Israel to stop construction in Judea and Samaria under the excuse that Jewish construction in these regions is an obstacle to peace. The EU Ambassador to Israel, Lars Faaborg-Andersen, recently threatened Israel with “increased isolation” should peace talks fail.